Florida’s thoroughbred industry is huge, but horse racing isn’t the only game in town (or the state). Florida is also home to the thrilling equine sport of polo, and hosts some of the most prestigious polo venues and tournaments in the world. Whether you’re a longtime enthusiast or a novice, read on to discover Florida’s rich contributions to the sport, and where you can watch it right here in Ocala. The game we now know as polo got its start in Persia between 6 B.C. and 1 A.D; it spread from there to the Byzantine Empire where it was loved so much that the emperor himself built a huge polo stadium inside the palace. From Asia Minor, it spread through the centuries as far away as India and China, always popular with royalty and the aristocracy–while horse racing earned the title “Sport of Kings” in the West, polo has long retained that designation in Eastern cultures. Modern polo was introduced to the West in the 19th century through British colonization of India; the first official polo club was established in 1833 in the Indian town of Silchar. A few decades later in 1876, the first polo match was played in America at Dickel’s Riding Academy in New York City. Today’s polo is usually played with four players on mounts, and resembles something of a combination of soccer and croquet on horseback. The object is to drive a small ball into the opposite team’s goal with long-handled mallets, over a large field that can be as big as nine football fields long. The game requires exceptional horsemanship and precise hand-eye coordination, and is exciting to watch due to its fast-paced nature and the sheer amount of skill involved on the part of the players. While polo in America got its start in New York City, Florida is now the modern international center for the sport–specifically International Polo Club Palm Beach in Wellington. IPC is the largest polo facility in the country, spanning 250 acres and hosting some of the biggest names in international competitive polo such as Aldolpho Cambiaso and Nic Roldan. All of their matches are open to the public, and spectators can enjoy the game in style with field-side champagne brunch, grandstand and stadium seating, and field tailgating. The Club is currently hosting the US Open Championship®, the most prestigious tournament in the United States. You can catch the action all this month, until the final on April 23rd. Click here for the full US Open schedule. And if you can’t make it out to Wellington, don’t fret–you can watch polo right here in Ocala at the Villages! The Villages has its very own Polo Club that’s open to the public all season long. 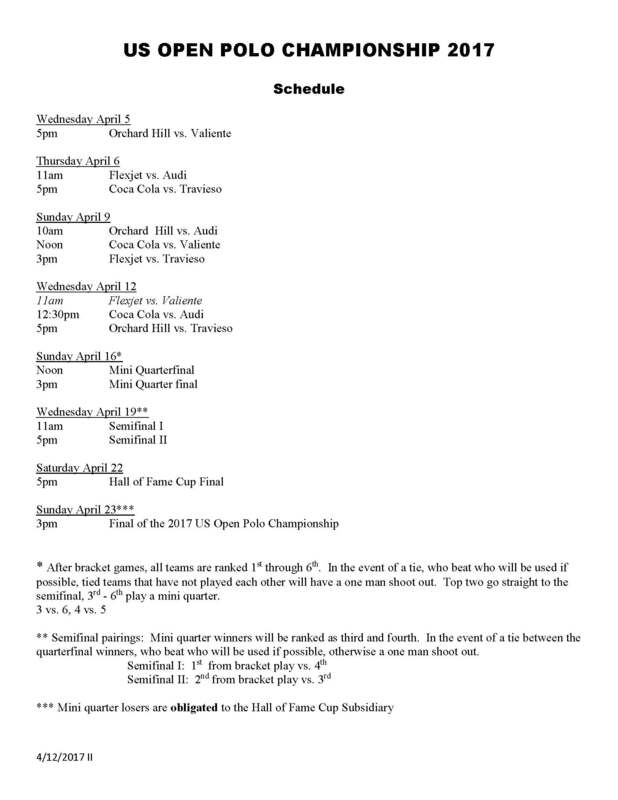 Matches are played every Friday and Sunday from March 17th through May 28th. Come on out and enjoy a day of summer sunshine and exciting equine sport!